The sister restaurant to Maxie’s Southern Comfort opened in July 2010. Too bad I didn’t hear about Blue’s Egg until right before my Boston-bound departure. Located near Gilles Frozen Custard on Wauwatosa’s east side, Blue’s Egg took over the space vacated by one of the last Heinemann’s in Milwaukee. The interior is warm and comforting – taking you back to the feeling of diners of yesteryear – with chrome, neon signs, kitsch and smooth lines. The restaurant is open daily for breakfast and lunch. Who doesn’t like the idea of brunch any day of the week? The menu has old favorites with a new twist like a curried tofu benedict or a chicken and spinach mac & cheese. The line is long but well worth the wait. Instead of giving you the standard coaster-buzzer to await your table you get a playing card. 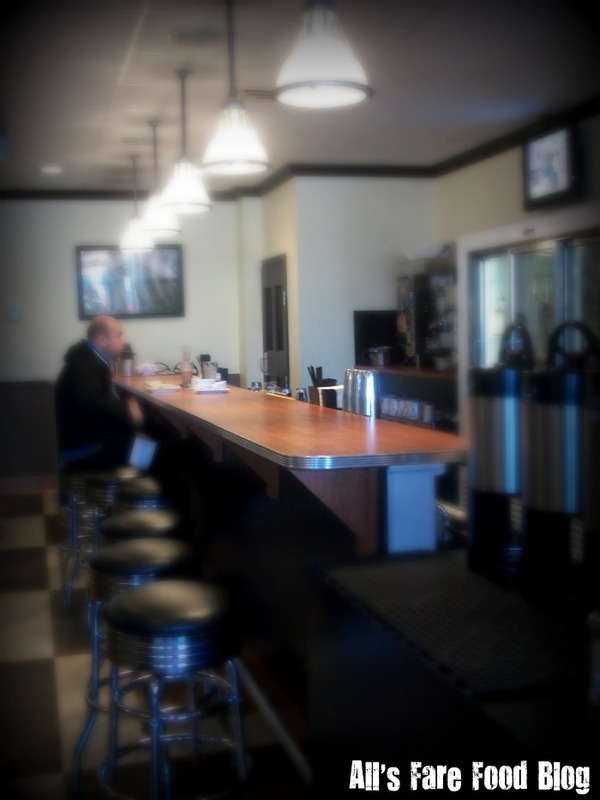 The waiting area isn’t too large and people pile over into the nearby counter area looking out for a spot. We recently went for brunch on a Sunday on two occasions. The wait the first time – for a group of four – was about 40 minutes. The second time – for just Brett and I – was only about 20 minutes. Make it through the wait and you won’t be disappointed. Blue’s Egg has a full bar. 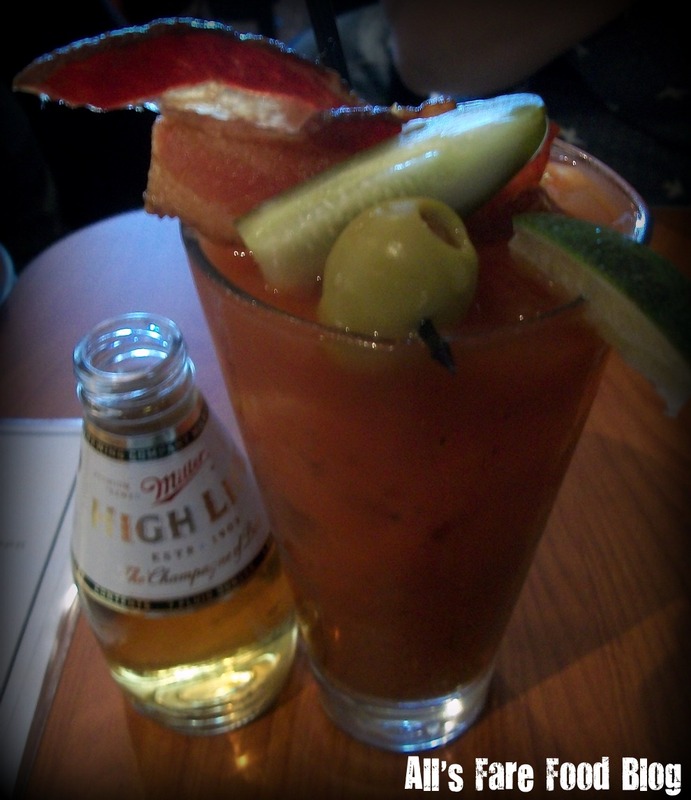 Amber, one of our dining companions during our first brunch, ordered Blue’s Bloody Mary ($7.50) – a mixture of Ketel One Vodka, tomato juice, spices, bacon and more, and served with a mini-bottle chaser of Miller High Life. 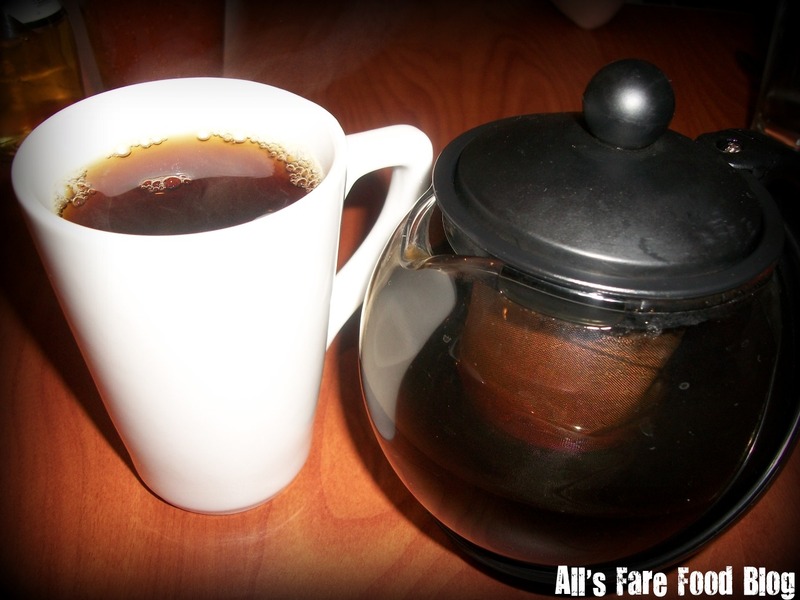 I opted for a pot of Earl Grey tea. Sixteen-ounces of loose leaf tea is $3.50 and it’s super cute! 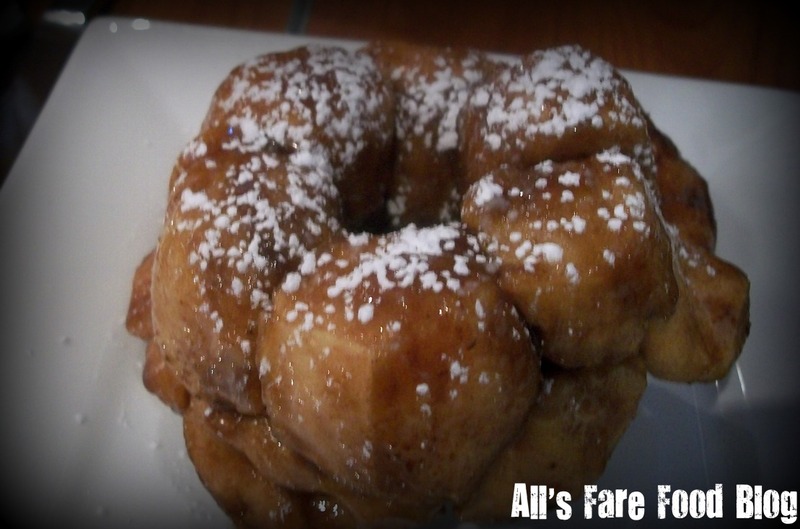 On both visits, we enjoyed Monkey Bread – a pull apart treat that is doughy, gooey and sweet. It was like dessert as an appetizer. Along with the Monkey Bread, each table gets a little fruit plate of grapes and dipping sauces. Plus, you get a bottle of water for your table so you’re never going unhydrated through your meal. There are various other pastries that you can start your meal off with, as well. I wanted to try Blue’s Egg’s daily coffee cake – which was a cranberry walnut slab. I was so full that I took it home for later that evening after dinner. It was the perfect dessert after heating up in the microwave and with a little bit of vanilla bean ice cream. 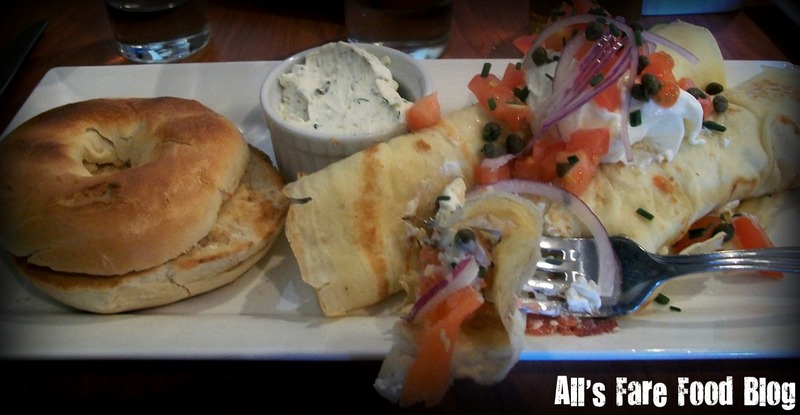 Amber ordered the smoked salmon crepe for her entree. Served with a caper cream cheese, potato, onion and a bagel, it was light entree but was deceivingly filling. 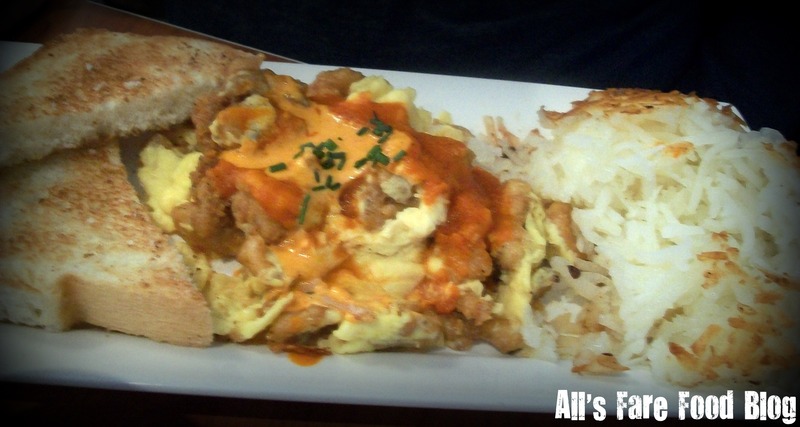 Our other dining partner – Johnathan – ordered the shrimp, bay scallop and calamari scramble. It came with toast and hash browns. 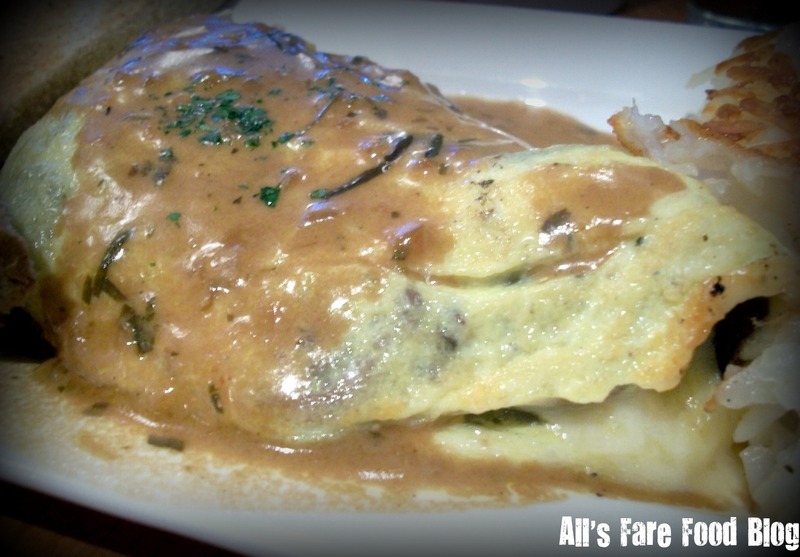 Brett ordered the roast mushroom omelet on our first visit. It is filled with provolone and a tarragon sauce. On my first visit, I ordered the raisin and walnut strata. It comes smothered in this caramel sauce of sugary goodness. In no way should this dish be legal. We came back the second time just for this dish – which Brett beat me to the punch to order. It was just as good. 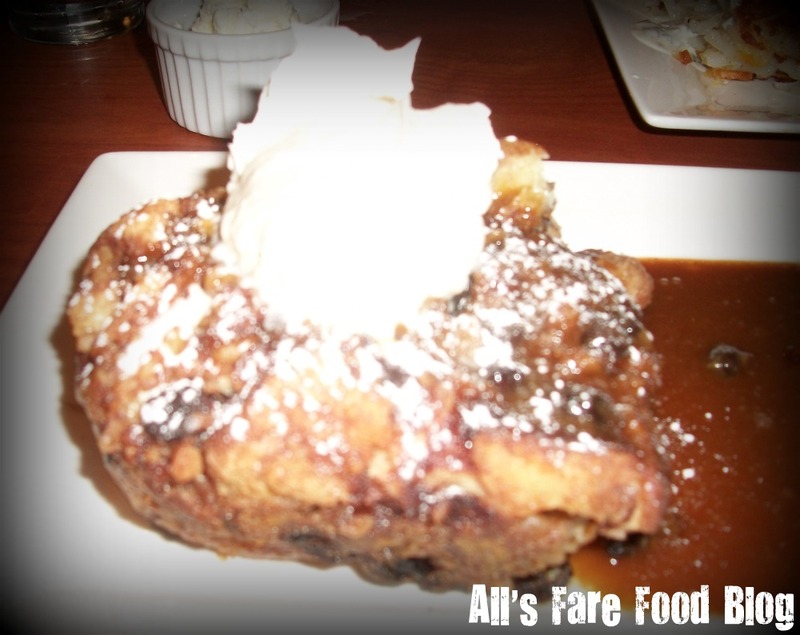 If you’re a fan of bread puddings, you’ll love this one. On our second visit to Blue’s Egg, I ordered the mixed grain pancakes. 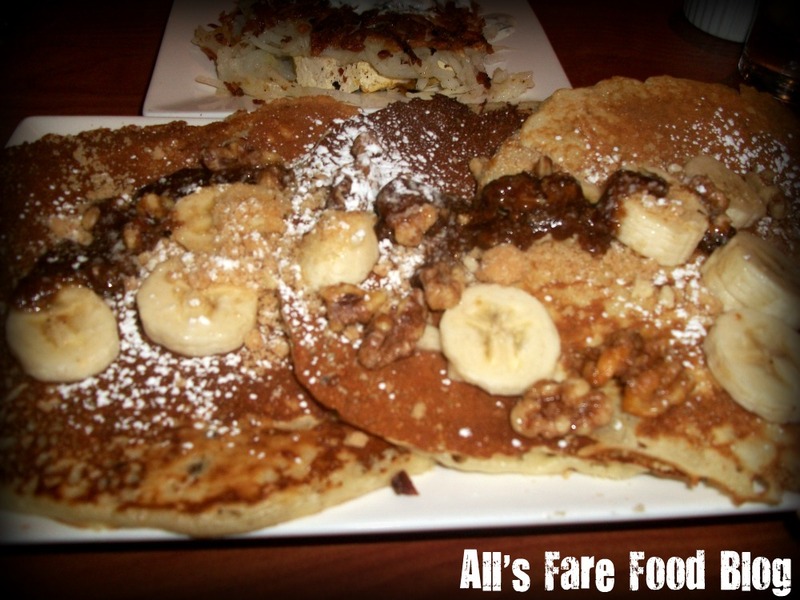 These ‘cakes are the size of hubcaps and are covered with bananas, candied walnuts and syrup. I thought by ordering the mixed grain I was going a little healthier, but I think the candied nuts and syrup negated any health benefits. Most breakfast entrees come with your choice of sides. Try one of Blue’s Egg’s stuffed ‘browns. These hash browns are uber crispy and filled with ingredients from cheese and herbs to tofu and creme fraiche. I tried the roasted mushroom browns with creamy leeks and herb creme fraiche and the curry tofu “skinny browns” stuffed with tofu, curry, mint yogurt and toasted almonds. The latter, surprisingly, was my favorite, and it heated up great the next morning. 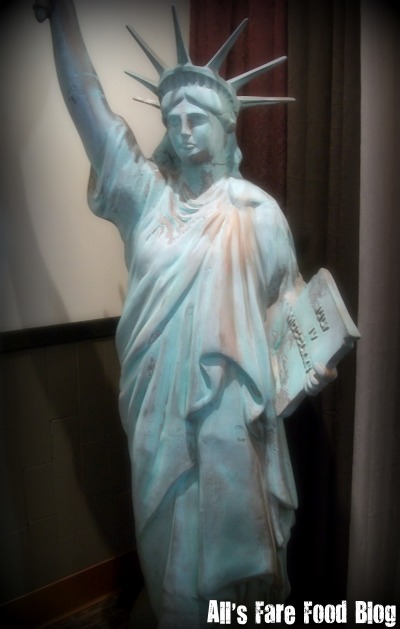 Even Lady Liberty enjoys her meals at Blue’s Egg. She’s there every day. Do your civic duty and try out their fabulous dishes ASAP! Learn more about Blue’s Egg at www.bluesegg.com. Download the breakfast, lunch or drink menu. 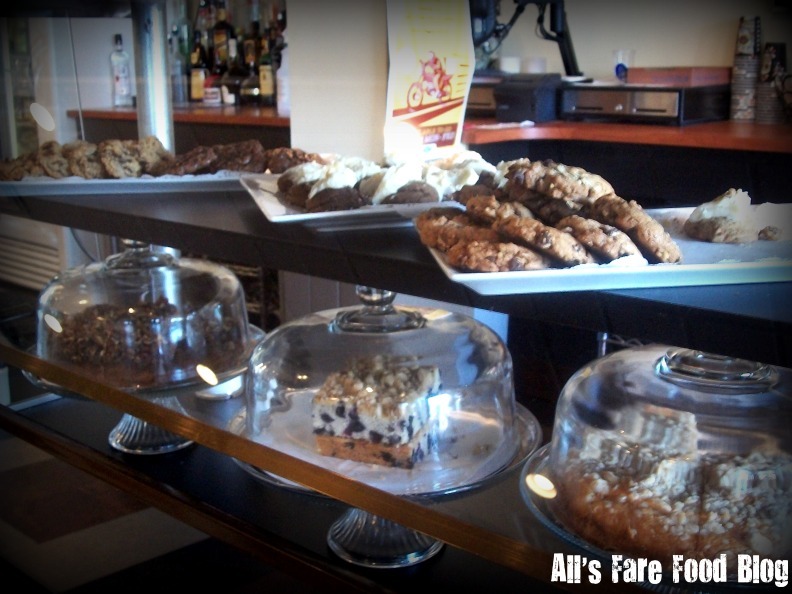 This entry was posted in Cuisine - American, Places - Milwaukee and tagged Bloody Mary's, Blue's Egg, breakfast, brunch, coffee cake, Earl Grey, eggs, Gille's Frozen Custard, Heinemann's, Maxie's Southern Comfort, Monkey Bread, strata, stuffed hash browns, Wauwatosa by Christina. Bookmark the permalink. I loved Blue’s Egg when my wife and I dined there. We didn’t try the Monkey Bread, but both of our dishes were awesome. We’ll definitely be dining there again.